One of the characteristics of modern quilt design is the expansive use of negative space. We know that negative space is the empty space or background that surrounds the design elements, but do we know how to incorporate it into our own quilts? Sometimes the best way to learn is to see it used visually. So this month, for our program, we'd like to show multiple quilts that incorporate various amounts of negative space. And that's where YOU come in! 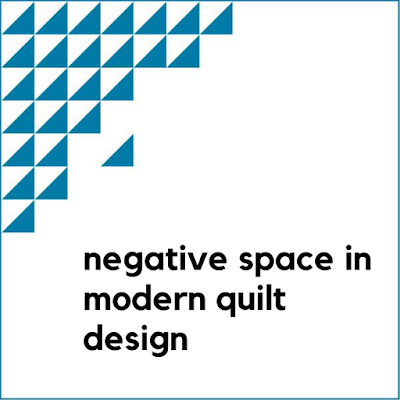 Please bring any quilts you've made or own that use negative space in a modern way. Even if you've shown the quilt during our regular Show and Share - we'd like to see it again! Hopefully, we'll all go home inspired and ready to use expansive negative space in our own quilt designs! Sign-ups continue for our Spring Retreat at Wildacres, April 25-28. Cost is $235, cash or check. You can still sign up at the early-bird prices for our Spring workshops with Kitty Wilken. Cash or check, please. We can't wait to see your January Block of the Month, Intersection. In addition to your quilts with negative space, please bring any recent creations for our monthly Show and Share. Don't forget to return any books that have been checked out from our library. We hope to see you at our February 2nd meeting, from 1-3pm at St. Giles Church, 1021 Hudson Rd., Greenville, SC.